White kitchens continue to be the most popular choice by customers. This is because a white kitchen acts as a blank canvas that you can add to in any way. It works equally well for very modern interiors as it does for traditional ones and you can express yourself through the style of the kitchen itself or through the colours and accessories that you combine it with. White is of course the colour of choice for the most modern of kitchens. Create a super sleek, uber modern minimalist space with high gloss cabinets, chrome and minimal accessories. A corresponding colourless décor scheme will heighten the feeling of modernity still further or achieve high contrast with black or dark grey such as this dramatic example showing the Lucido kitchen or the Gloss range. You can create a softer look by toning down a modern white kitchen or adding a few subtle embellishments. The Image kitchen, shown here teamed with wood and a deep red colour scheme, and the Cologne kitchen with its soft rounded edges, show how modernism and traditional details can combine to create something that feels fresh but homely. Often associated with more modern styles, white can work just as well in a traditional kitchen. Bronze details, toning granite worktops and tiles and display cabinets with spots make this Shaker style Heritage kitchen feel traditional but not dated. 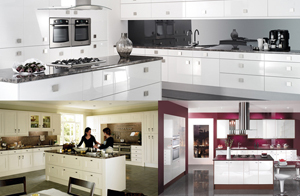 You can browse these and other white kitchens in our Kitchens by Colour gallery. For help planning your kitchen why not book a consultation? 1 Response to "A closer look at our Kitchens by Colour: White"
Anxious to see the finished pic!I love white, but the hub wants a dark stain, I must do sinhteomg with our kitchen, I'm hoping you inspire me to get going! I will check Betsy's Blog!